For the first time LHCb measured the difference between matter and antimatter in D0 mesons, particles composed of a charm quark and an up antiquark. The difference in the behaviour of matter and antimatter, known as CP violation, is one of the key processes to understand why the Universe is composed only by matter particles and why there is no residual antimatter. It’s the first time this effect is observed in particles containing the charm quark with fractional charge of +2/3. This asymmetry was observed in 1964 in decays of particles containing the strange quark and, later, in 2001, in particles containing beauty quarks, both with a charge of -1/3. It took almost another 20 years to reach this fundamental achievement which opens new scenarios in our understanding of the Universe and in the verification of the Standard Model. 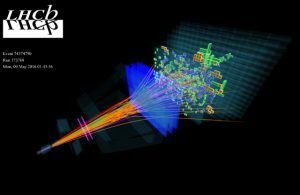 LHCb, one of the four major experiments in data-taking at the LHC accelerator of CERN, analysed about 100 million of D0 meson rare decays collected between 2011 and 2018, measuring a very small effect, around 0.15%. This crucial milestone has been achieved also thanks to the excellent capability to identify the different kinds of particles, a unique feature of LHCb. The Italian LHCb community gave a fundamental contribution to this measurement, namely through the data-analysis carried out by the Bologna INFN group. The activity of the 13 LHCb groups of INFN ranges from the detector construction to functioning operations, including data-analysis. In particular, Frascati National Laboratories are the leaders in muon detection and reconstruction, having built a significant part of the detector and the related software.